One of the many joys of being in the self-publishing business is getting to know people who are simply crazy about their books. After we published author Aniruddha’s translations of The Hobbit, The Fellowship of the Ring and The Two Towers, all of which are impressive in themselves, we were delightfully surprised to meet Henk “Hobbithunter” Brassien. To understand why Henk is such an interesting person to know, we’d rather have Henk explain himself. Since many years I collect books by and on Tolkien. I am specialised in The Hobbit.On my site www.hobbithunter.nl you can find my collection of some 450 Hobbits in 66 languages / from 66 countries (including) the Bengali translations of The Hobbit & The Lord of the Rings. It all started in the end of 2010, when Aniruddha / Santi Chatterjee asked me if I was interested in a copy of The Hobbit in Bengali. Yes, I certainly was. The only problem was, that he did not have a publisher yet. I advised him to try and find a publisher that would Print On Demand. And then Santi found Dogears (CinnamonTeal Publishing). (In) May 2011 I ordered five copies, later that year another ten. 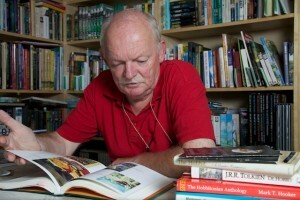 I am with early retirement and have – as a hobby – a webshop, where I sell books by and on Tolkien: www.hobbithunterbookshop.com. My private copy of the Bengali Hobbit has a sticker with “This is the first copy”, of which I am very proud. 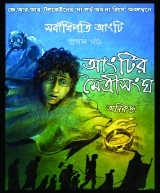 Although I can not read one single word in Bengali, I like the illustrations that much, that I also ordered the Bengali translations of The lord of the Rings. Parts one and two have arrived, now I wait for the publication of part three. That’s right! Translations of various Tolkien works in more than 66 languages now. With Bengali being the only Indian language among them, there is so much scope to add to Henk’s collection. This blog is maintained by the folks at CinnamonTeal Design and Publishing. If you would like to guest blog, do contact us at contactus@cinnamonteal.in.